In recognition of emerging demographic and clinical trends, the WAIS-IV A&NZ Language Adapted edition was developed to provide you with the most advanced measure of cognitive ability and results you can trust when addressing the changing clinical landscape. Here you have clear directions and in one tap, the timer begins. Track the time and easily score the response with just a tap. Capture the client’s response, even the rotation and gap. Access to quick administration tips. The examinee is presented two words that represent common objects or concepts, and describes how they are similar. This subtest measures verbal concept formation and reasoning. For picture items, the examinee names the object presented visually. For verbal items, the examinee defines words that are presented visually and orally. This subtest measures word knowledge and verbal concept formation. The examinee answers questions that address a broad range of general knowledge topics. This subtest measures the ability to acquire, retain, and retrieve general factual information. The examinee answers questions based on his or her understanding of general principles and social situations. This subtest measures verbal reasoning and conceptualisation, verbal comprehension and expression, the ability to evaluate and use past experience, and the ability to demonstrate practical knowledge and judgment. Using a paper key, the examinee copies symbols that are paired with numbers within a specified time limit. This subtest measures processing speed, short-term visual memory, learning ability, psychomotor speed, visual perception, visual-motor coordination, and visual scanning ability. The examinee completes this subtest using the same paper key and response booklet as the traditional paper/pencil administration, and not on his or her digital device. Working within a specific time limit, the examinee scans a search group and indicates whether one of the symbols in the target group matches. This subtest measures processing speed, short-term visual memory, visual-motor coordination, cognitive flexibility, visual discrimination, psychomotor speed, and speed of mental operation. The examinee completes this subtest using a paper/pencil response booklet, and not on his or her digital device. 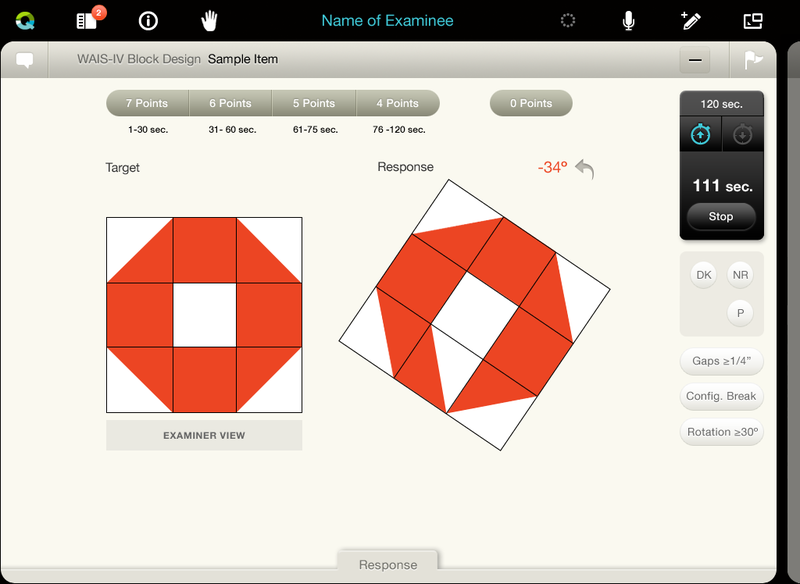 Working within a specified time limit, the examinee scans a structured arrangement of shapes and marks target shapes. This subtest measures processing speed, visual selective attention, vigilance, perceptual speed, and visual-motor ability. 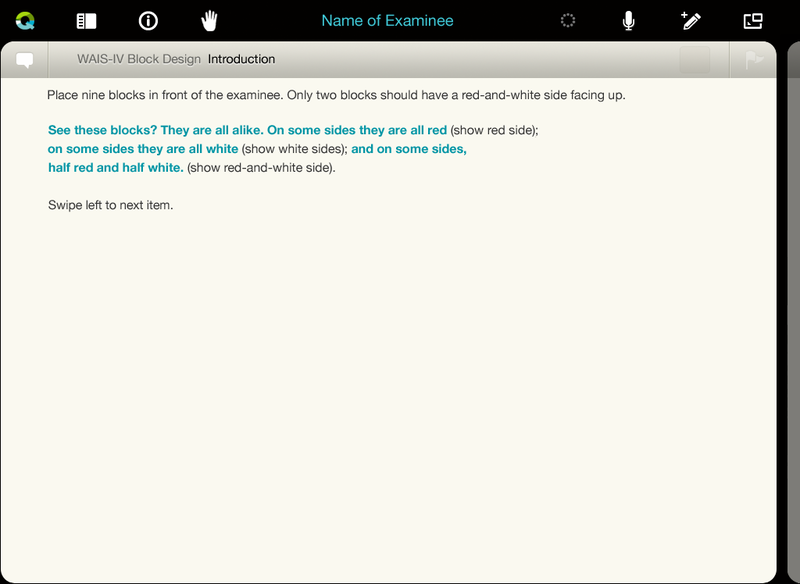 The examinee completes this subtest using a response booklet, and not on his or her digital device. For Digit Span Forward, the examinee is read a sequence of numbers and recalls the numbers in the same order. For Digit Span Backward, the examinee is read a sequence of numbers and recalls the numbers in reverse order. For Digit Span Sequencing, the examinee is read a sequence of numbers and recalls the numbers in ascending order. This subtest measures working memory, mental manipulation, cognitive flexibility, rote memory and learning, attention, and encoding. Working within a specified time limit, the examinee mentally solves a series of arithmetic problems. This subtest measures working memory, mental manipulation, concentration, attention, short- and long-term memory, numerical reasoning ability, and mental alertness. The examinee is read a sequence of numbers and letters and recalls the numbers in ascending order and the letters in alphabetical order. This subtest measures working memory, sequential processing, mental manipulation, attention, concentration, memory span, and short-term auditory memory. Working within a specified time limit, the examinee views a model and a picture, or a picture only, and uses red-and-white blocks to re-create the design. This subtest measures the ability to analyse and synthesise abstract visual stimuli. 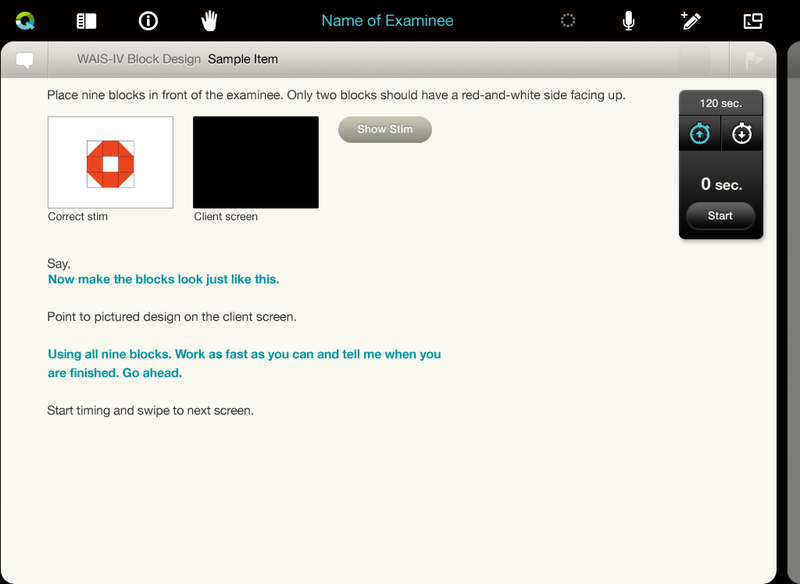 The examinee completes this subtest using the same blocks as on the traditional administration, and re-creates the design on his or her digital device. The examinee views an incomplete matrix or series and selects the response option that completes the matrix or series. This subtest measures fluid intelligence, broad visual intelligence, classification and spatial ability, knowledge of part-whole relationships, simultaneous processing, and perceptual organisation. 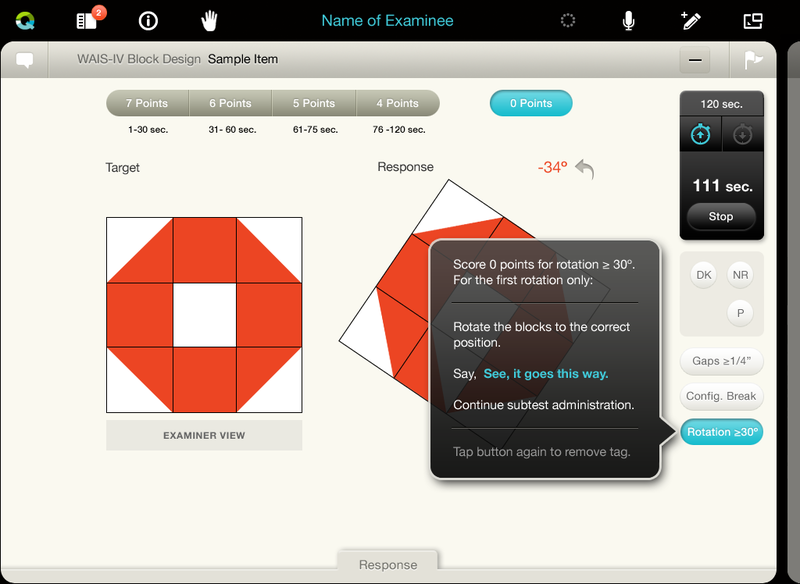 Working within a specified time limit, the examinee views a completed puzzle and selects three response options that, when combined, reconstruct the puzzle. 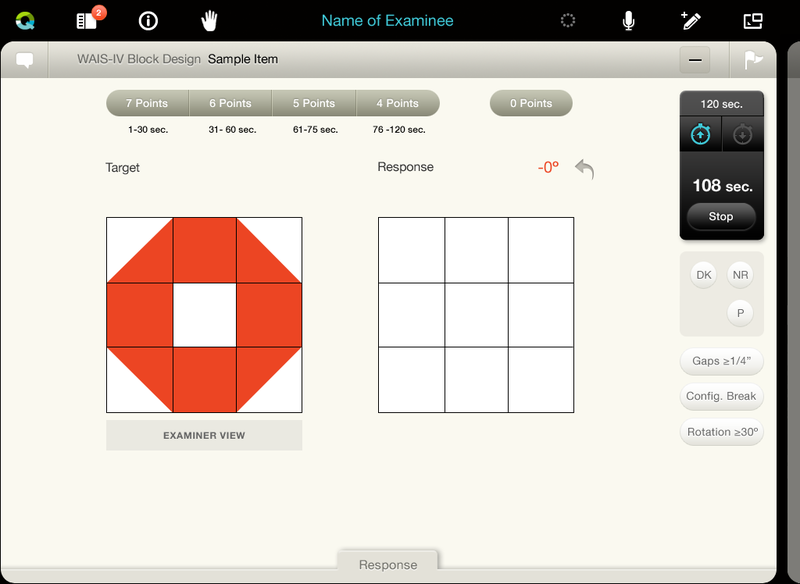 This subtest measures nonverbal reasoning, and the ability to analyse and synthesise abstract visual stimuli. Working within a specified time limit, the examinee views a scale with missing weight(s) and selects the response option that keeps the scale balanced. This subtest measures quantitative and analogical reasoning. Working within a specified time limit, the examinee views a picture with an important part missing and identifies the missing part. This subtest measures visual perception and organisation, concentration, and visual recognition of essential details of objects. Q-interactive is an easy-to-use iPad application that allows clinicians to choose, administer and score clinical assessments via two tablets connected by Bluetooth. With a constantly growing library of digital clinical assessments, Q-interactive provides flexibility, convenience and efficiency. © 2019, Pearson Clinical. All rights reserved. ABN: 40 004 245 943.